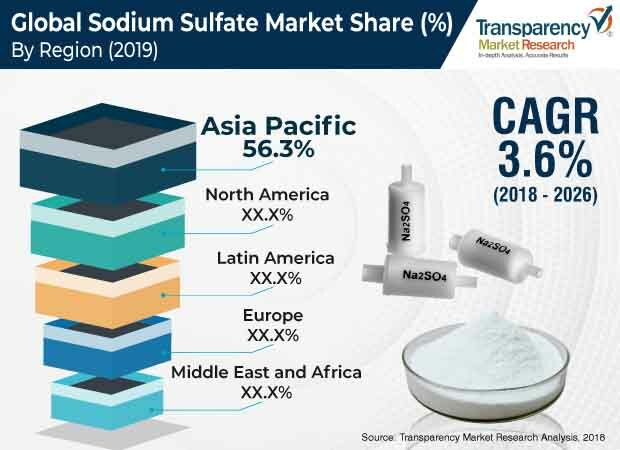 The global sodium sulfate market was valued at US$ 504.7 Mn in 2017 and is anticipated to expand at a CAGR of 3.56% from 2018 to 2026, according to a new report titled ‘Sodium Sulfate Market: Global Industry Analysis, Size, Share, Growth, Trends, and Forecast, 2018–2026,’ published by Transparency Market Research (TMR). The global sodium sulfate market is driven by the rise in application of sodium sulfate in various end-use applications such as detergents and textiles. Sodium sulfate is used as a filler in powdered detergents. The detergents industry is the major consumer of sodium sulfate. Increase in global population is boosting the demand for consumer products. This, in turn, is fueling the detergents market. Sodium sulfate is employed in the manufacturing process of glass. It is used as fining agent to manufacture scum-proof glass. Textiles and glass industries are expanding at a rapid pace in Asia Pacific. Sodium sulfate helps lower the negative charges of fabrics so that the dyeing effect on fabrics is excellent. Expansion in the textiles industry is propelling the demand for sodium sulfate. Furthermore, the automotive industry is expanding at a fast pace in Asia Pacific and Latin America. This, in turn, is boosting the demand for high quality glass. Sodium sulfate is used in the manufacture of scum-proof glass. This is augmenting the demand for sodium sulfate in the glass application segment. Based on source, the sodium sulfate market has been bifurcated into natural and synthetic. Natural is expected to be the major segment of the market during the forecast period. The natural method is used to derive sodium sulfate from mirabilite. The U.S. has 16 mines of natural sodium sulfate in North America. China is a prominent producer of sodium sulfate across the globe. In terms of demand, the country accounts for 50% to 60% share of the global sodium sulfate market. Based on region, the global sodium sulfate market has been classified into North America, Europe, Asia Pacific, Middle East & Africa, and Latin America. Asia Pacific is estimated to be the leading region of the sodium sulfate market during the forecast period. Growth in population is fueling the consumer goods industry. This, in turn, is driving the demand for detergents in Asia Pacific. Commercially, sodium sulfate is widely used as filler in powered detergents. Additionally, sodium sulfate minimizes the negative charges of fabrics and provides excellent dyeing effects. Expansion in the textiles industry in emerging economies of China and India is a major factor boosting the demand for sodium sulfate. Growth in the automotive industry is augmenting the consumption of glass. This, in turn, is driving the demand for sodium sulfate in the manufacture of scum-proof glass. Furthermore, improvement of lifestyle is boosting the demand for luxurious products (including carpets). In turn, this is propelling the demand for carpet cleaners and other cleaning agents. High degree of competition exists among market players operating in the sodium sulfate market. The market is moderately fragmented. It is dominated by large players. Key players account for major share of the market. Prominent players profiled in the report are Alkim Alkali Kimya A.S., Birla Cellulose, Cordenka GmbH & Co. KG, Cooper Natural Resources, Elementis plc, Lenzing Group, Minera De Santa Marta, S.A., S.A. Sulquisa, Searles Valley Minerals, Saskatchewan Mining and Minerals Inc., Grupo Industrial Crimidesa S.L., Sodium Sanayii Anonim Sirketi, and XinLi Chemical.